It's a bracing, rambling, flavorful way to kick off the new year. It's a bracing, rambling, flavorful way to kick off the new year. Be in Big Sur from Jan. 15 through 17, 2016. LOOK DOWN AT THE GROUND: If you had to name the period of the year where you spend the most time glancing down, would you pick wintertime? There's a solid argument to be made here. After all, we glance down, at the ground, when we need to find our presents under the Christmas tree. We keep an eye on ice and snowy patches when we're in a colder clime. And the start of the year, and the heart of the winter, is prime mushroom time around much of the state. Making for an especially mushroom-laden location, alongside a guide or chef, can make for a fine bout of foraging, which, of course, involves a bit of scoping the earth beneath your feet. It's a meditative pursuit, though, and a flavorful one, too, if fungi happen to be your jam (and mushrooms are so very tasty in jam, and honey, and a host of dishes beyond the traditional pastas and bakes). 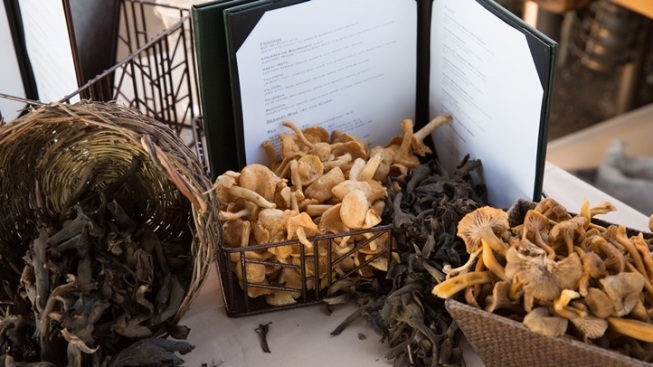 Big Sur is rich in mushroomiania, and it takes a long weekend, each January, to spotlight those chefs and mavens who love the idea of a solid forage followed by some excellent eating. The Big Sur ForagersFestival pops up from the new ground of the new year on Jan. 15, 16, and 17, 2016. RESTAURANTS TO NATURE: "Big Sur area restaurants will host the culinary expertise of notable chefs preparing unique fare from rustic to elegant, pairing with the region's amazing selection of wines and beers," reveals the site. Fungus presentation, cocktail gatherings, a Grand Chef Dinner, and a Sunday morning forage-focused hike alongside Chef John Cox are bright lights on a bright roster, as are the two Wild Foraging Walks and Talks. One happens at beautiful Pfeiffer State Park and the other in the Big Sur Wilderness. (The events are beginner and intermediate, respectively.) A Forager's Kitchen session takes on a host of foraged goodies, from chanterelles to sorrel, at the hands of "some of Big Sur and Carmel's best chefs," artists who know their straight-up-from-the-ground stuff. WE DO... look down at plates while we eat, out of necessity, but there aren't too many getaways where keeping our eyes on the earth below is key. This is one of the biggies, and one of the tastiest, too, if mushrooms are, as we said, your jam. Seriously, though: mushroom jam. Think about it. It's pretty dang zingy on a burger, and a host of other dishes, too.